Mischa Barton is the kind of woman who can do anything. She’s a reputable actress, she’s a model and fashion designer, she’s a style icon, and she just seems like the kind of person that we all want to be friends with. We can dream, right? Over the course of her career, Mischa has transformed from a child star into a fully-fledged legend, but that’s not to say that she hasn’t had a few bumps in the road. Despite this, the transformation of Mischa Barton is certainly one to admire. Although we all know Mischa Barton for her American accent and her life in the United States, it might surprise you to know that she was actually born in London. With an English father and an Irish mother, she spent the first five years of life living in the United Kingdom with her parents and her two sisters. While her father’s work took her and her family to New York when she was just a youngster, Mischa has always regarded London as one of her safe spaces. She even retreated to her London townhouse when life in Hollywood became all too much. From a young age, it was clear to see that Mischa was destined for the limelight. She was a natural-born performer, and it didn’t take long for her to bag herself her first acting role. From 1994 until 1997, Mischa Barton continued her reign on the stage. Although she was young, she was able to command the audience and show those who came to watch that she was on the road to success. Those who worked with the young actress knew that she was going to be a star, and it was only a matter of time before her talents were required off the stage and in front of the camera. In 1997, she made her very first movie debut in the fantasy drama movie, Lawn Dogs, and this was the catalyst for something truly special. Within just a few short years, Mischa had transformed herself into one of the leading child stars in Hollywood – and she was barely even a teenager. During this time she worked on the romantic comedies, Notting Hill, the supernatural horror, The Sixth Sense, and the crime drama, Bonnie and Clyde. It was clear that she was going to have an impressive career ahead of her, but Mischa wasn’t done just yet. She also wanted to take the television world by storm, and she did just that in 1994. In 1994, Mischa was offered the chance to take on a minor role in the sitcom, All My Children. She just couldn’t turn the offer down, and although she was only hired to play a character in flashback episodes, she was an immediate hit with fans. Because of this, she was offered the chance to return to the show in 1996, where she replaced actress Michelle Trachtenberg to become a recurring character. It was this exposure that took her up a notch, and what ultimately sparked a career that took her to something truly special. Mischa spent the late ‘90s working on various different TV shows and movies, but it was a phone call in the early ‘00s that truly changed her life. In August 2003, the world got to watch in wonder as Mischa Barton became Marissa Cooper in the teen drama series, The O.C. This show followed the lives of a group of teens as they lived by the beach and spent their days trying to deal with teenage drama. The show was an instant hit, and fans at home loved the raw themes within the storylines, as well as Mischa’s character. Mischa Barton appeared on The O.C for a whopping three years, and during this time she became a true icon. Although she was already a star, this exposure allowed her to transform from child star to teen superstar, and everyone wanted a piece of her. She was invited to the hottest celebrity parties, she was nominated for countless awards for her portrayal of Marissa, and she was even chosen to appear on the cover of magazines such as Cosmopolitan, Glamour, and Allure. She was at the top of her game. Because she was one of the lead characters in The O.C, fans were heartbroken when she chose to leave the show in 2006. Although the producers tried to keep going on without her, the star had gone, the flame had gone out, and the reason people tuned in to watch had left. Ultimately, The O.C was canceled just one season later. But why did she leave? Well, it seems as though Mischa had a change of heart. While she had enjoyed life in the limelight, she didn’t know if it was for her any longer. Just mere weeks after leaving her Marissa Cooper behind, Mischa Barton decided to flee the bright lights of Los Angeles in search of her safe place; London. After a whole year in the United Kingdom, Mischa found it in herself to return to Hollywood and return to her acting career. It seemed as though she nestled back in with ease, but her 2007 attendance at Nicole Richie’s Memorial Day barbecue sparked a downward spiral for the actress. She fell ill during this party and was rushed to ER after drinking alcohol while on prescription antibiotics. It’s believed that the mixture caused her to have a reaction, and she was thankfully nursed back to health. However, the drama was not over. Just six months after Mischa was rushed to the hospital, she found herself spending the night in a jail cell. She was caught driving while under the influence and was immediately taken in by the cops. She pleaded guilty to the crime as part of a plea deal and was ultimately served with a 36-month probation. She was also forced to pay a fine and attend alcohol education classes. During an interview with Nylon Magazine, Mischa noted that this was “a low point for me” and that she had never thought she would ever be arrested. Although Mischa is not the only celebrity to ever be charged with a DUI, the media picked up on her crime more than most. She was hoarded by paparazzi, and it seemed as though they were trying to find any piece of dirt to dig up about her professional and personal life. By the time 2008 came around, there were countless unflattering photos and stories of Mischa being sold to tabloid newspapers and magazines, and it seemed as though this constant publicity was getting to her. Yet, she tried not to let it get the better of her career. In 2009, Mischa was offered the chance to star alongside Ashton Kutcher in the drama series, The Beautiful Life. However, during the promotional tour, she was nowhere to be seen. It was later discovered that Mischa had been hospitalized in a psychiatric ward. At the time, she and her team did not comment on this hospitalization, but she later spoke to The View about it a few months after being discharged. She noted that she took painkillers for a tooth infection and that she felt “completely overwhelmed” with the goings-on in her life. Despite all of the drama in her life, Mischa was determined to keep acting. Although she still worked on various television shows, she largely spent her time on the set of Hollywood movie sets. She kept herself busy, and it seemed as though she was getting herself back on track. She also took advantage of this newfound lease of life to begin a new business venture. In 2012, she released her very own online clothing range, which also sold cosmetics, bath products, and accessories. Sadly, this business is no longer running. Throughout her career, Mischa had always relied on her mother to keep her professional life in check. Not only did Nuala Barton have her best interests at heart as Mischa’s mother, but she was also hired as her daughter’s manager. However, their relationship fell into disarray in 2015 when the actress filed a lawsuit against Nuala. Mischa claimed that her mother and manager had not been honest about money she had earned during a 2013 movie role, and kept some of the money for herself. Mischa later had a change of heart and rescinded her lawsuit. By 2016, Mischa knew that her professional reputation was on the line. She had undergone numerous personal struggles, and some of her latest professional projects had been complete flops. In January 2017, Mischa’s life took a tumble once again when she found herself in the presence of the cops and a team of doctors. This experience was caught on camera and has since gone viral. 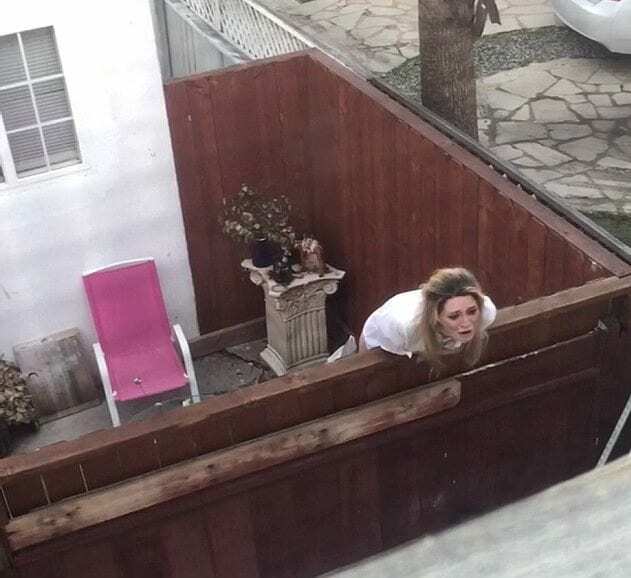 After acting erratically and shouting in her backyard, Mischa’s neighbors took it upon themselves to call the cops. They were worried about their own safety, and the safety of the actress, because they had never seen her that way before. She later told Dr. Phil that she had an illegal substance put in her drink. Mischa’s exploits in her backyard soon made their way across news stations and tabloids across the world, but unfortunately, this wasn’t the end of her drama in 2017. Just two months after this event, Mischa discovered that a former flame was distributing an explicit video of her and that it was making the rounds on the internet. Mischa called a press conference for this news and stated that she had filed for a restraining order against the ex. She also wanted to prove that she was in control of the situation, despite the “pain and humiliation” of it. With all of this going on in her life, Mischa has still been able to maintain her place in the world of acting and show business. In fact, in October 2018, the news broke that Mischa would appear in the sequel to the famous reality series, The Hill. The Hills: New Beginnings will come onto our screens in 2019, and follow the lives of these former cast members now that they are much older. Although Mischa was not an original cast member, fans are excited to get a glimpse into her life. There’s no doubt about the fact that Mischa Barton has undergone a dramatic transformation over the course of her life. She has struggled with her personal life, but she has rarely let this affect her approach to her work. She has continued to show the world that she is a talented actress and celebrity icon, and we have her to thank for some of the most legendary characters of all time. Hopefully, she has had enough drama to last her a lifetime, and she can now focus on what she does best.